The brake system provides a means of using friction to either slow，stop, or hold thewheel of a vehicle. It converts mechanical energy into heat energy. Master cylinder - hydraulic-piston pump that develops pressure for the brakesystem. It is located in the engine compartment on the firewall，directly in front ofthe driver's seat. A typical master cylinder is actually two completely separatemaster cylinders in one housing，each handling two wheels. This way if one sidefails，you will still be able to stop the car. The brake warning light on the dashwill light if either side fails，alerting you to the problem. Master cylinders havebecome very reliable and rarely malfunction. Brake booster - vacuum-or power steering-operated device that assists brake pedalapplication. It is mounted on the firewall directly behind the master cylinder. Itspurpose is to amplify the available foot pressure applied to the brake pedal so thatthe amount of foot pressure required to stop even the largest vehicle is minimal.Power for the booster comes from engine vacuum. The automobile engine producesvacuum as a by-product of normal operation and is freely available for use inpowering accessories such as the power brake booster. Vacuum enters the boosterthrough a check valve on the booster. The check valve is connected to the enginewith a rubber hose and acts as a one-way valve that allows vacuum to enter thebooster but does not let it escape. The booster is an empty shell that is divided intotwo chambers by a rubber diaphragm. There is a valve in the diaphragm thatremains open while your foot is off the brake pedal so that vacuum is allowed to fillboth chambers. When you step on the brake pedal, the valve in the diaphragmcloses，separating the two chambers and another valve opens to allow air in thechamber on the brake pedal side. Brake lines - metal tubing and rubber hose that transmit pressure to the wheelbrake assemblies. The brake fluid travels from the master cylinder to the wheelsthrough a series of steel tubes and reinforced rubber hoses. Rubber hoses are usedonly in places that require flexibility, such as at the front wheels，which move upand down as well as steer. The rest of the system uses non-corrosive seamless steeltubing with special fittings at all attachment points. Emergency or parking brake - mechanical system for applying rear brakeassemblies. The parking brake system controls the rear brakes through a series ofsteel cables that are connected to either a hand lever or a foot pedal. 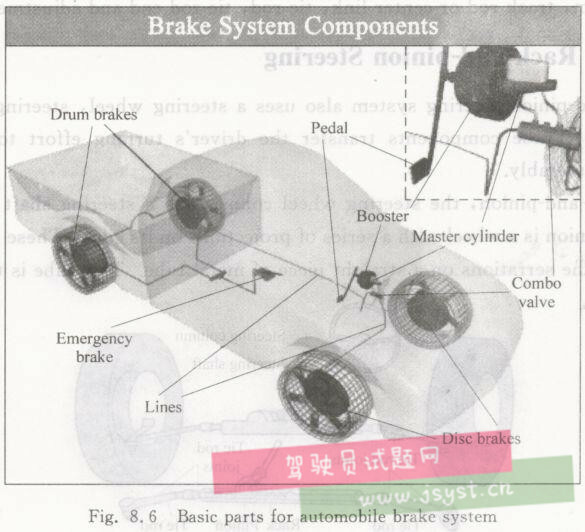 The idea isthat the system is fully mechanical and completely bypasses the hydraulic systemso that the vehicle can be brought to a stop even if there is a total brake failure. When the driver pushes on the brake pedal，lever action pushes a rod into the brakebooster and master cylinder. This produces hydraulic pressure in the master cylinder.Fluid flows through the brake lines to the wheel brake assemblies. The brake assembliesuse this pressure to cause friction for braking. Any emergency brake system uses cables or rods to mechanically apply the rearbrakes. This provides a system for holding the wheels when the device is parked on a hillor stopping the vehicle during complete hydraulic brake system failure.